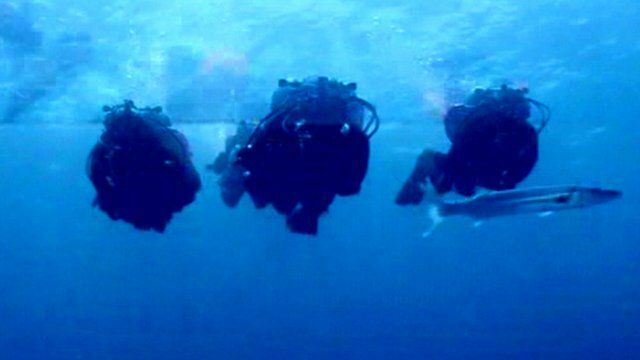 Underwater living record broken Jump to media player Fabien Cousteau and his team have broken the record for the number of days spent living under water - a record set by his grandfather the famous ocean explorer Jacques Cousteau. Man on a mission to save oceans Jump to media player Enric Sala, a Spanish marine biologist, has taken up an oceanic conservation role with National Geographic. Underwater footage of Pacific marine life Jump to media player American multi-millionaires have clubbed together to fund an ultra-powerful radar system to catch fishermen plundering marine life round the legendary island of Cocos. Oceanographer Fabien Cousteau and his team have broken the record for the number of days spent living under water. The record was formerly set by his grandfather the famous ocean explorer Jacques Cousteau. The scientists had been living at an underwater laboratory off the Florida coast since 1 June to study what effects climate change and pollution are having on a coral reef.